Orlando has once again been designated as a bronze-level Bicycle Friendly Community from the League of American Bicyclists. City leaders, businesses, schools, and community members are continuing to work hard to take this designation to the next level and make Orlando a city that is welcoming to our friends on two wheels. The City of Orlando is putting forth a vision of walkable and bikeable streets that accommodate all road users. Bicyclists are being recognized when making changes to streets and upgrading infrastructure. Streets like Edgewater Dr. embrace the Complete Streets model, providing things such as bike lanes and safe speed limits. This year, Edgewater Dr. was featured as a National Complete Streets Model by Smart Growth America. The City of Orlando also offers free bike racks and installation to businesses with a simple online application. Businesses with bike racks are welcoming to riders and the companies may even see a boost in business. Bikes, Beans, and Bordeaux Café is actually listed as a Bicycle Friendly Business by the League with a silver-level designation. It is one of just 14 Bicycle Friendly Businesses in the state. Can we add some more businesses to this list? Community members are invited to get involved in the biking community through a number of different platforms. 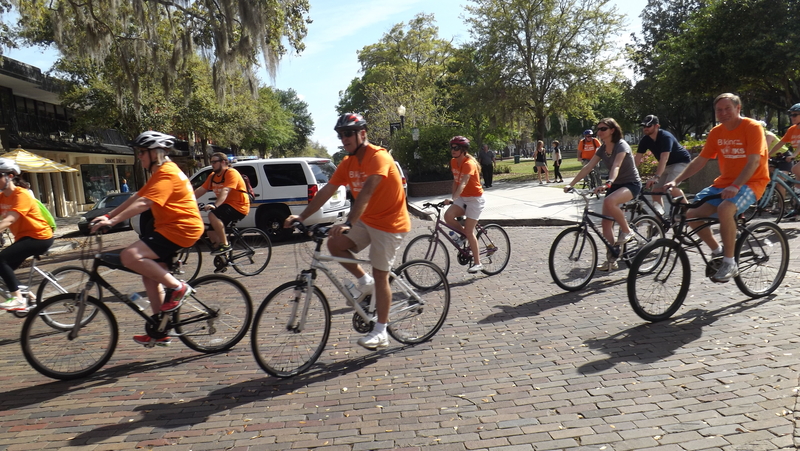 Each year, the City of Orlando hosts Bike to Work Day and encourages companies to put together a together a team of employees and get them biking to work. This year was the first year that the Juice Bike Share was around for Bike to Work Day and it was a huge hit with over 225 people participating. Many Orange County Public Schools also participate in the yearly Bike to School Day, where we can show little ones the fun of riding their bike while also teaching them bike safety. In March, BWCF worked with Healthy Central Florida to host a workshop on creating more bicycle friendly cities in central Florida and more than 60 people across 3 counties showed up. Representatives came from Longwood, Casselberry, the City of Orlando, Osceola County, Lake Mary, Florida Department of Transportation, MetroPlan Orlando, reThink Your Commute, Orange County Public Schools and the statewide Florida Bicycle Association. It is so great to see so many other communities aspiring to be on the Bicycle Friendly Community list. BWCF loves this progress and we are excited to see what’s next as central Florida embraces people on bikes.